"....Sarah SLACK, wife of William SLACK, Florence SLACK's paternal grandmother. She was born in Hognaston. They had a large family and lived in Main Street, Middleton in 1881. --- The photo was taken by A & G Taylor of 63 London Rd, Derby (Royal Warrant HM Queen & P of Wales). 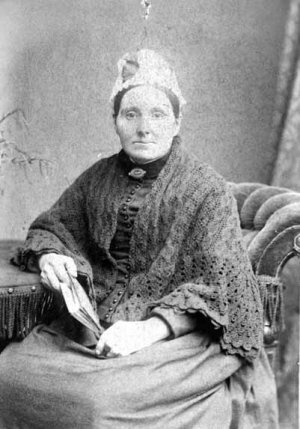 Sarah was 51 at the time of the 1891 Census. "